Greetings my friends. It’s been cold inside the hotel for the last couple of days but that has not stopped Katie and Me from making progress on the staircase. 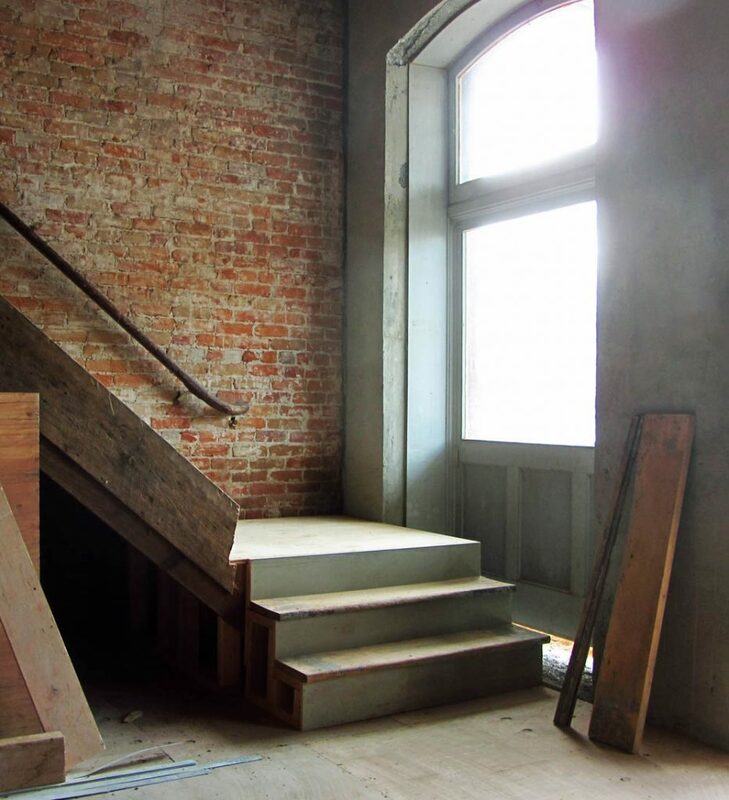 As expected, the concrete seismic work at the bottom of the stairs reduced the ground level landing size to the point where it was no longer code compliant. To remedy this, we removed the last three steps to make way for a plan so clever that it would make a weasel proud. 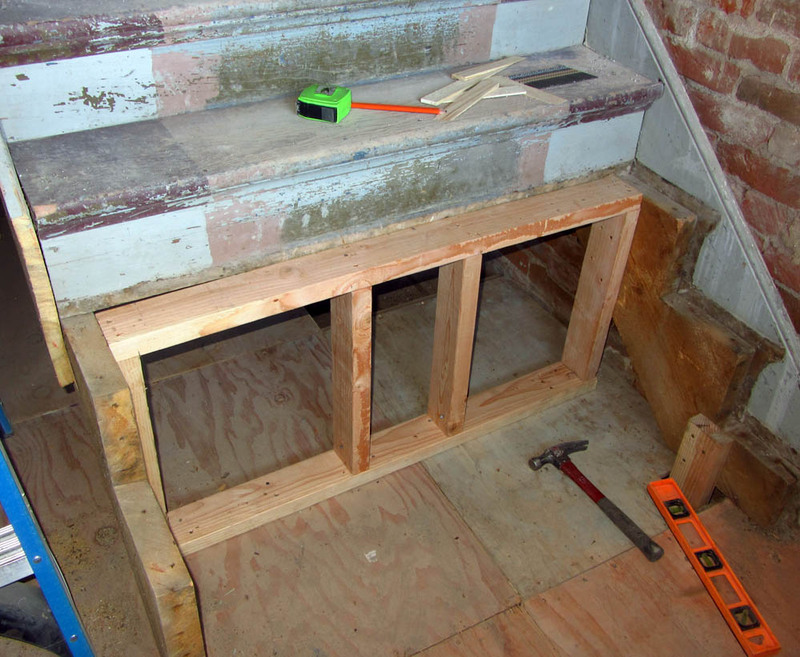 With the bottom three steps removed, it was an excellent opportunity to shore up the original stringers. 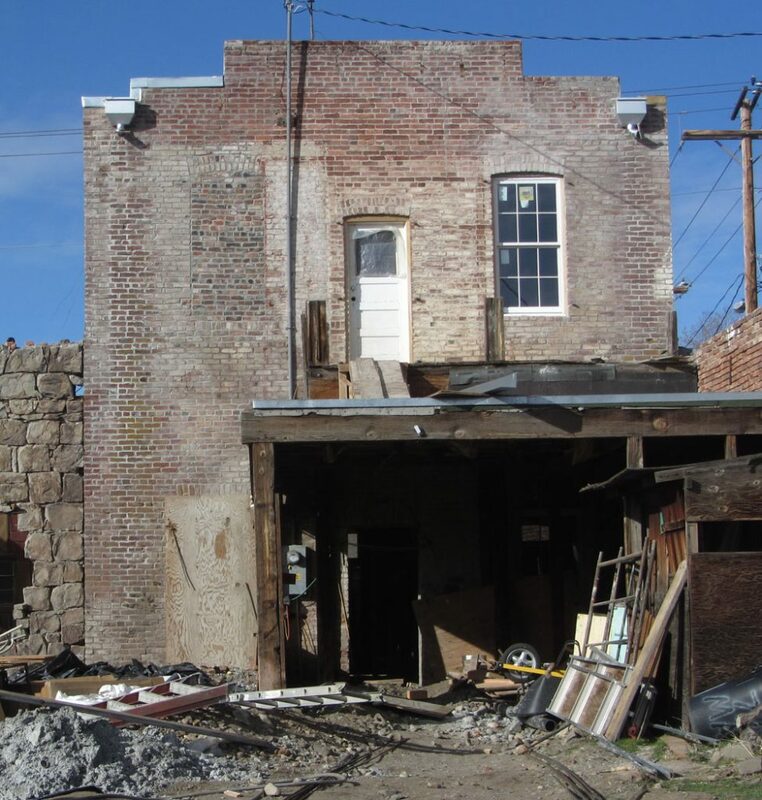 I built a short wall which I firmly attached to both the stringers and the floor below which removed much of the original wobble which had been there since 1870. Now here’s the clever bit. We moved the landing up three steps and turned the bottom of the stair 90 degrees to land in the saloon in a much more dramatic fashion. 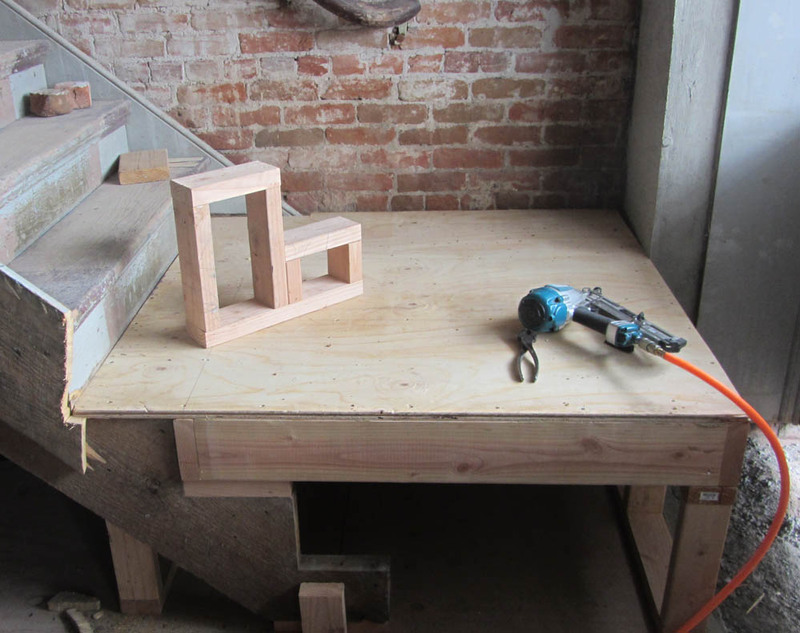 This entailed making short stringers for the new steps. Yes, they are a little awkward in design but it was just a matter of having a limited selection of tools. I have the perfect saw to make a standard stringer to match the originals but it’s in storage and dog help me in finding it. Sigh. The completed landing looks fine and I was even able to salvage the old stair treads to keep that wild west look. The one hitch is that the existing window seen here will now have to be replaced with tempered glass so that anyone running down the stairs after a couple of beers is not likely to run through the window and be impaled on the glass shards. It’s not likely to happen but better safe than sorry. 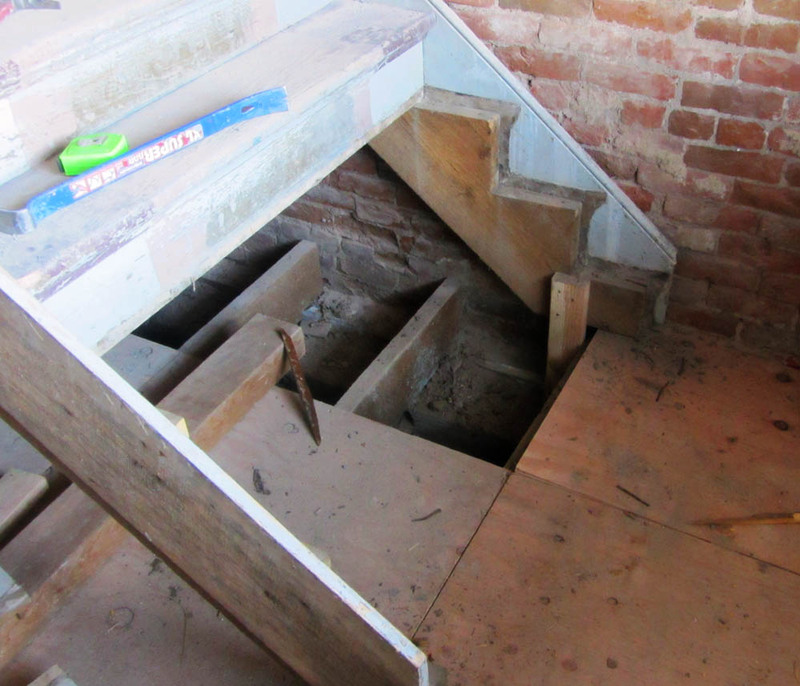 The next task, was the underside of the stairs. 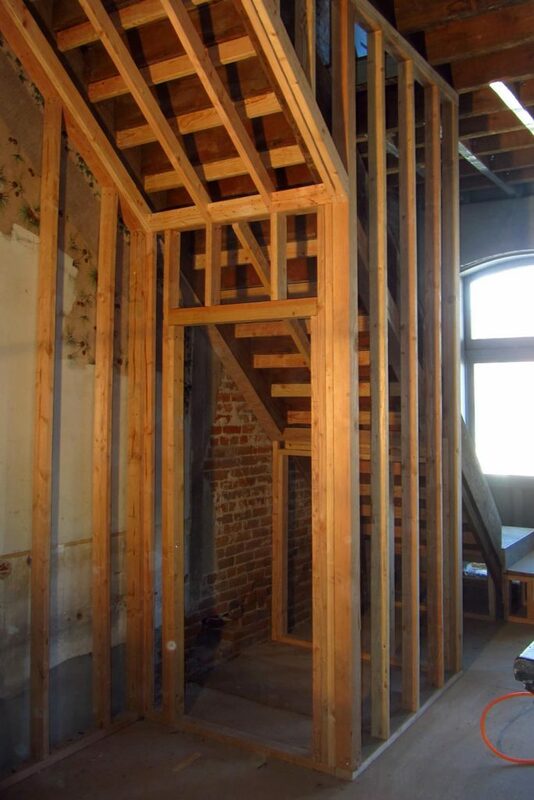 In order to make way for the drywall, the interior of the closet and the underside of the stairs outside the closet had to be framed out. The inside of the closet was easy since everything was within reach. The sloped ceiling outside the closet; however, was a bit more dodgy. It was accomplished by me balancing on an eight foot ladder with Katie cutting lumber and handing it up to me. If this isn’t romance, I don’t know what is. Finally, we gave ourselves a chance to do something more fun. 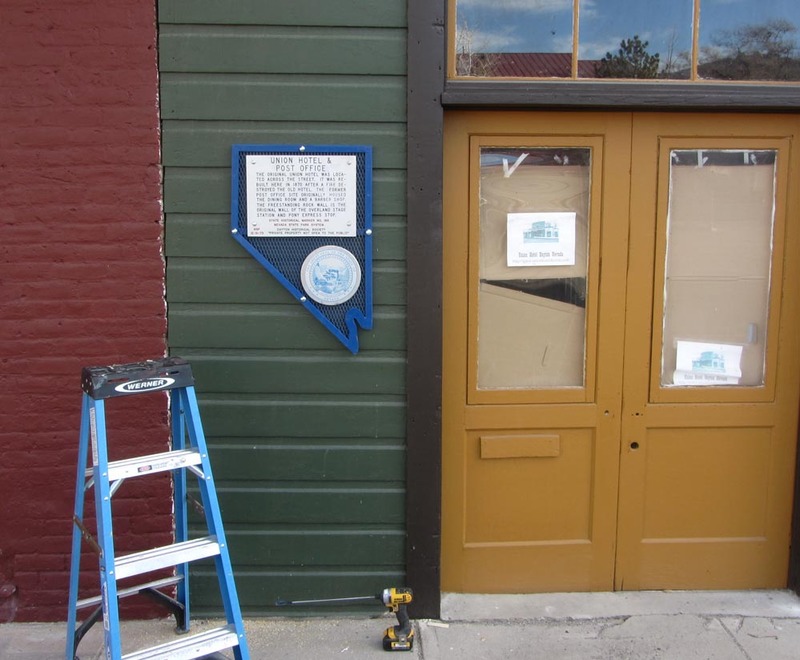 Katie and I bolted the historic marker on the front of post office. And the neighbors up the street approved. Now that we have windows, we’ve moved on to doors. Several of the doors that we’ve gathered are antiques that we rescued from a barn in Amador City CA. They’re very nice but they didn’t come with jambs or hinges so we had to buy a few new tools and learn a new skill. 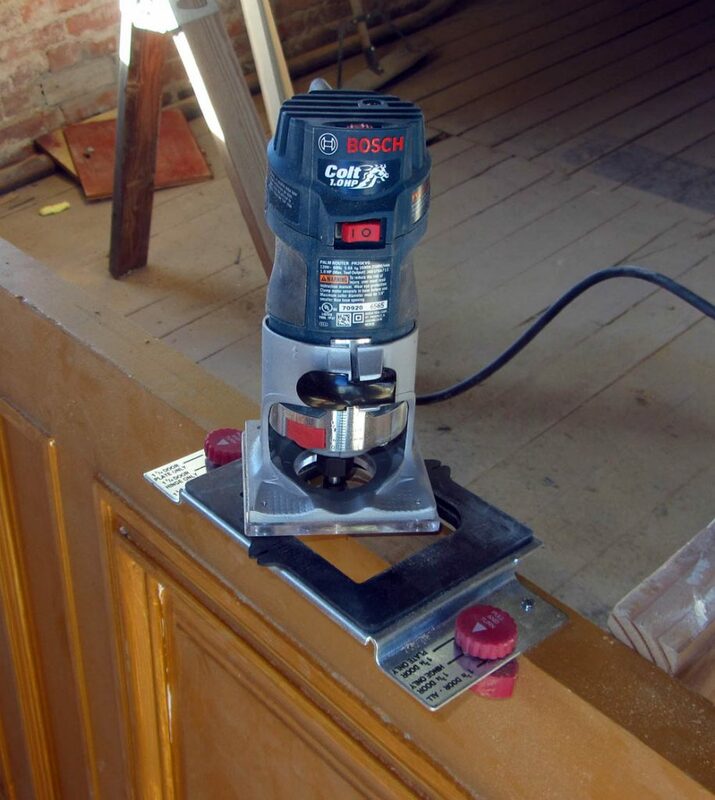 The router and hinge jig allows the perfect dado for hinges once one gets the hang of it. The learning curve was not too steep and our first attempts were pretty close although there were a few goof ups which lead to much head scratching on how to fix it. In the end; however, we made all the mistakes disappear and we were happy with the result. 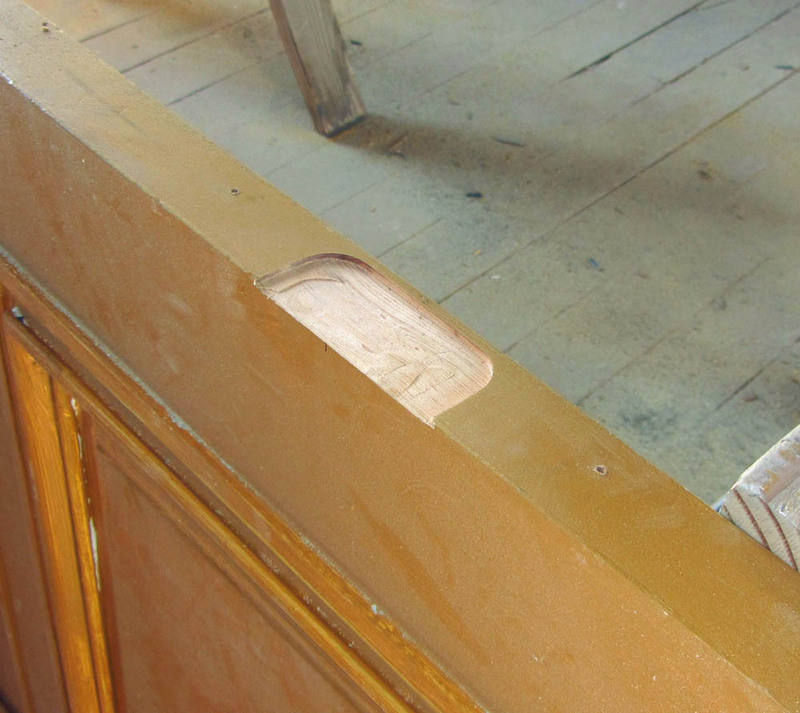 The real trick is making the hinge dados on both the jamb and the door align perfectly. This was tricky but doable. On a side note, the new jambs were fabricated from old base boards salvaged from the hotel guest rooms. It’s old growth pine and is better than anything we could have purchased. More importantly, it was already paid for over a hundred years ago. 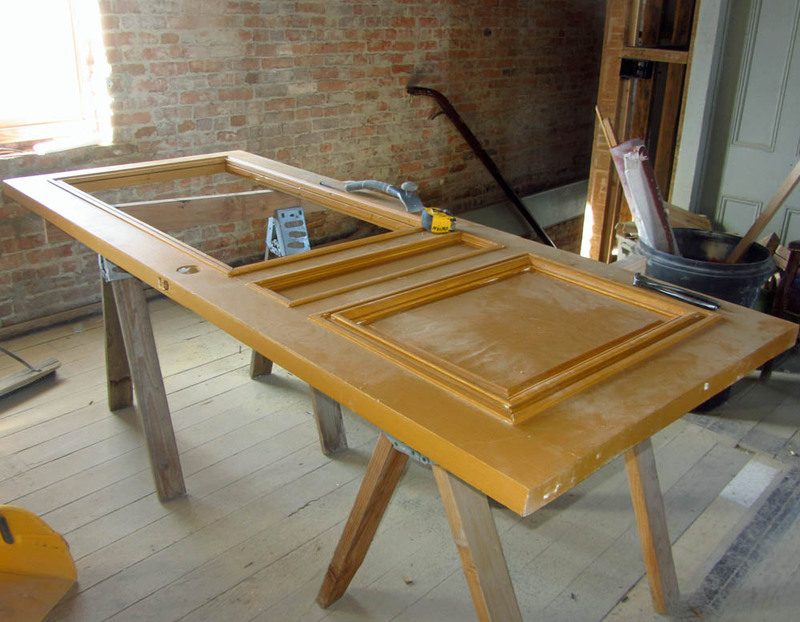 Another salvaged resource is the door hardware. 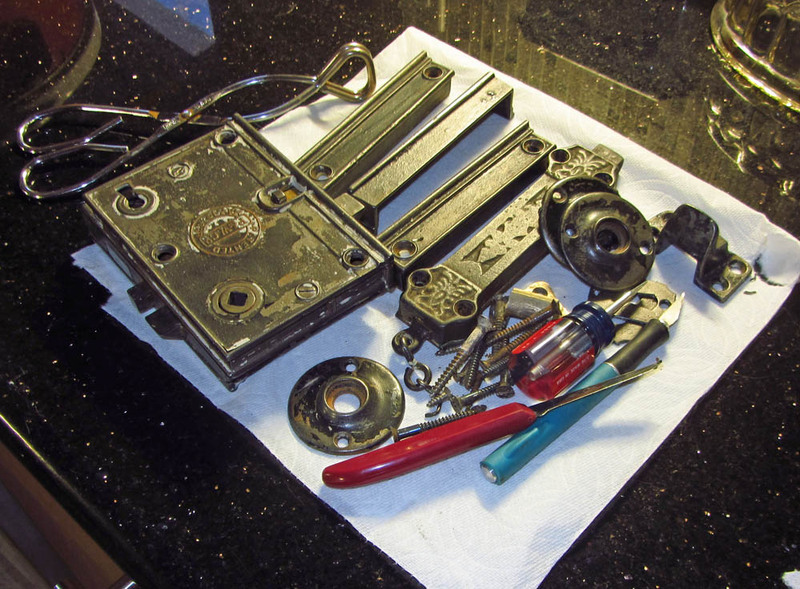 The vintage iron is incredibly durable and can be taken apart, lubed and reinstalled without a problem. The only challenge is that most of it is coated in several thick layers of oil based paint. 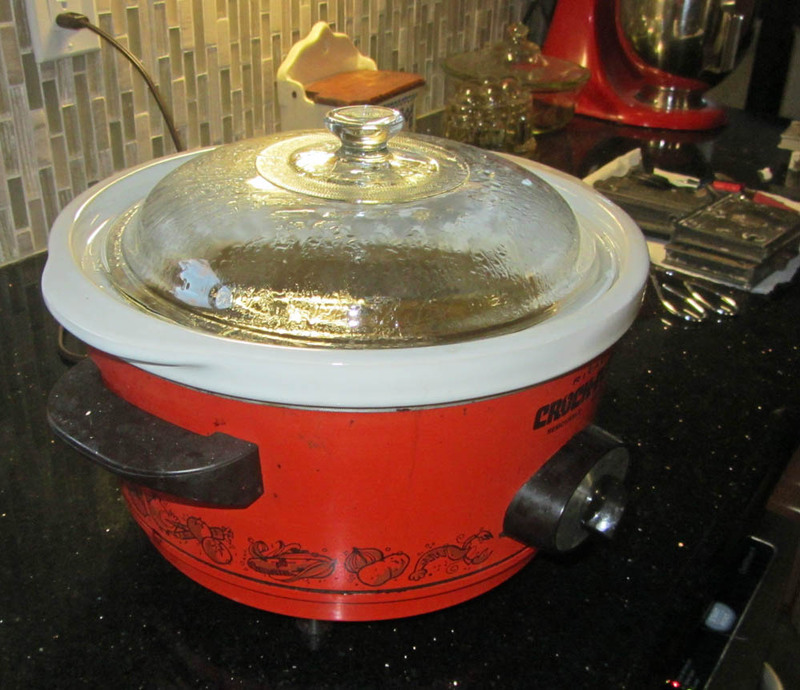 This can be overcome with a little help from Grandma’s crock pot which we found at the thrift store for eight bucks. We learned this trick from a PBS show long ago and it’s simply a matter of submerging the hardware in water with a dash of dish detergent and cooking it for eight hours. The old paint to falls right off! 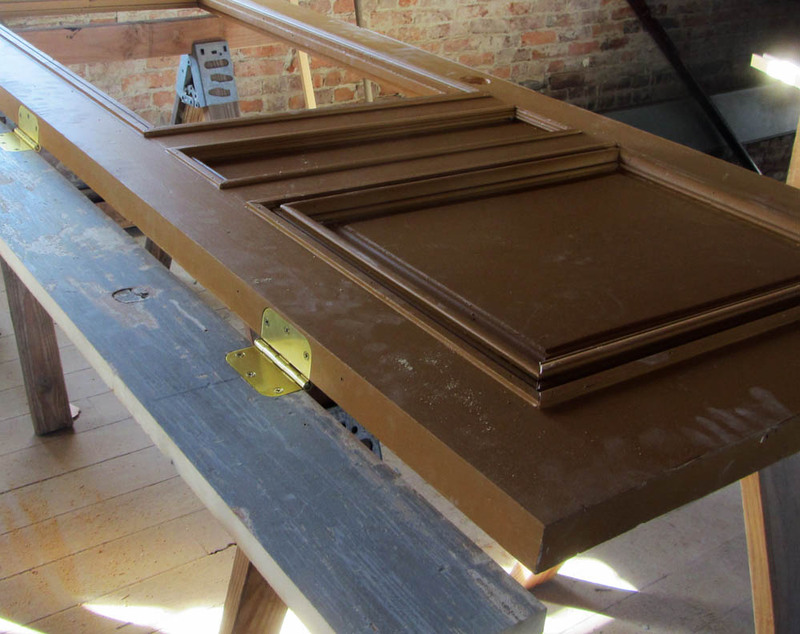 After that, the hardware gets a coat of gloss black spray paint to imitate the original finish. 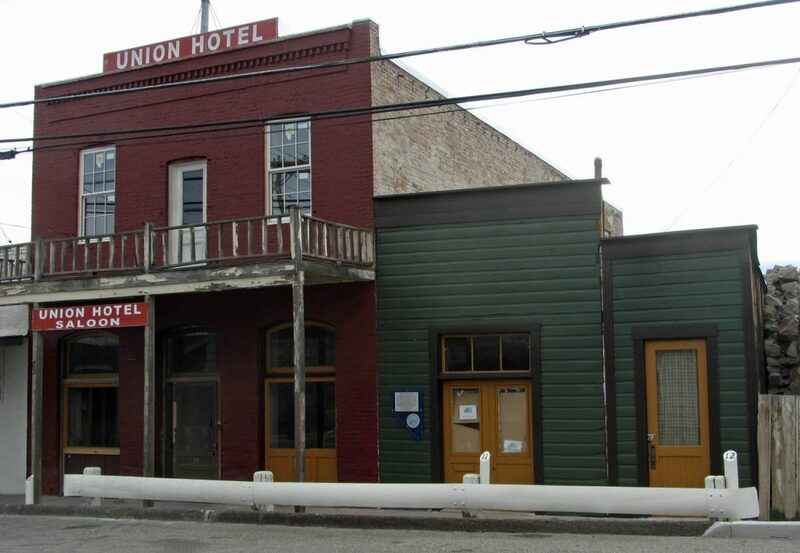 The big news for this week is that the seismic work on the interior of the hotel is coming to a close. The concrete work is finished and all of the testing completed so now, the other contractors can descend upon the site. First to come is the windows. 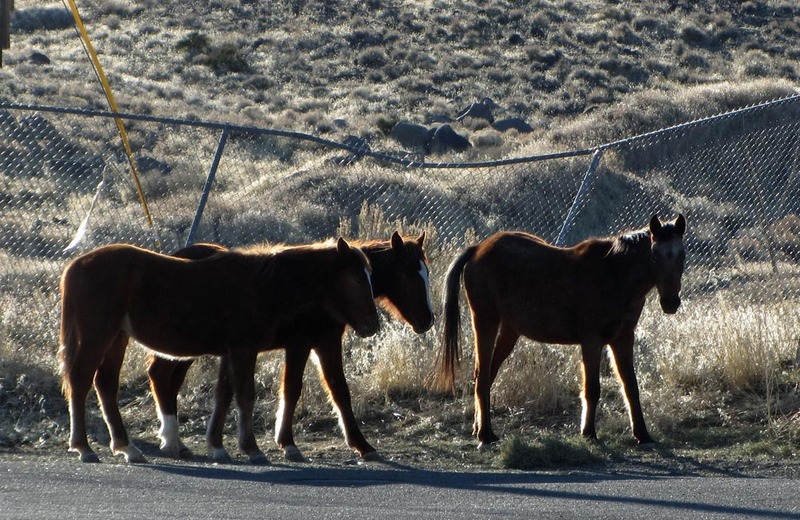 They had been sitting in a warehouse in Reno since October waiting for the concrete work to be completed but once that hurdle was in the past, installation went very quickly. 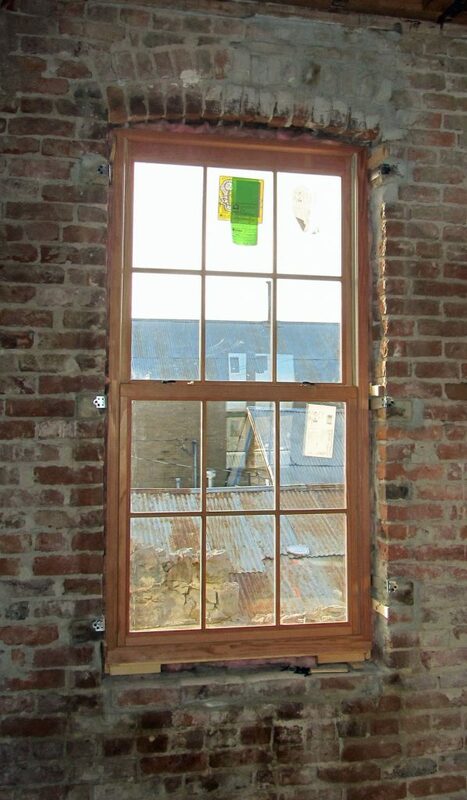 The windows are constructed of wood both interior and exterior to please the historic commission with the one compromise being that they are dual pane. The historic commission was okay with this because single pane windows just aren’t available at a reasonable price anymore. In any case, the hotel has become warmer and a lot quieter. Of course, no progress is ever achieved without the obligatory setback. While the windows were being installed, the wind kicked up and blew the back balcony door shut so hard that the glass shattered and sprayed out over the carport roof. The door should have been propped open with the vintage brick we keep handy just for that purpose but it wasn’t. In any case, the new glass will be tempered so that’s an improvement. On a more constructive note, Katie and I found a new stove for the saloon. It is a Thelin brand stove which was made in Mound House. Thelin stoves have been around for about 40 years and they have an interesting history. The first models were made from transformer housings salvaged from old power poles and the chromed rings were truck rims. Of course, new building standards have made the early Thelin stoves non code compliant but you can see that much of the early design is retained. Normally, Thelin stoves are quite expensive but thanks to Craigslist, we found this two year old model in Wellington for a fraction of the original price. Now, some may ask why we didn’t use the original parlor stove that came with the hotel. We would have liked to but it would have made the hotel difficult to insure. The Thelin stove we have now is UL listed and comes complete with installation instructions and proper wall clearances stamped on the back. What could be easier? 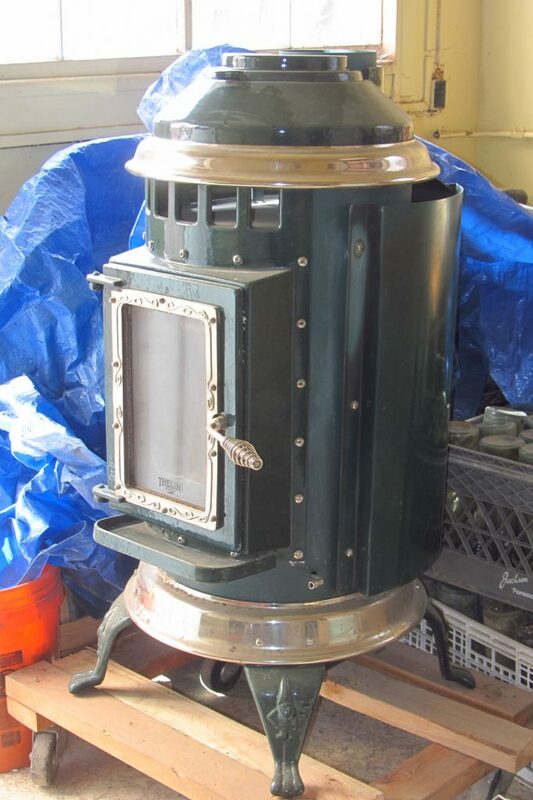 As for the original saloon stove, we plan on setting it up for decoration someplace as a non functioning unit.